The St. Helena medal was the first French campaign medal issued. It was instituted in 1857 by Emperor Napoleon III to commemorate the campaigns of the Revolutionary and Napoleonic Wars. Some four hundred thousand were struck and issued to those who had served under Napoleon I. The medal is of irregular shape, made of bronze. It is a medallion surrounded by a laurel wreath, tied at the bottom. It is surmounted by the Imperial Crown. The obverse of the medallion bears the effigy of Emperor Napoleon I. It is surrounded by the inscription “Napoleon I Empereur”. The reverse inscription reads: “Campagnes de 1792 a 1815. A Ses Compagnons de Gloire sa Derniere Pensee Ste. Helene 5 Mai 1821” (Campaigns of 1792 to 1818. His companions of glory were in his final thoughts. St. Helena 5 May 1821). The designer was Albert Désiré Barre. His privy mark, an anchor, is below the bust on the obverse. 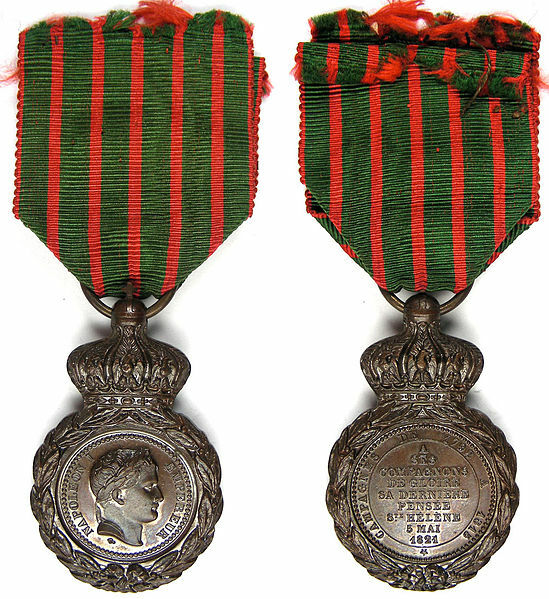 The medal is suspended from a green ribbon with five red stripes and thin red edges (see footnote). I saw this medal being auctioned online here in New Zealand and thought, what the hell, and brought it. Got it pretty cheap compared to what it is being sold for in the States and Europe. It is not a rare medal but is quite attractive and the thought that it was once proudly worn by some old soldier who had fought in the wars that I try to replicate on the tabletop is strangely comforting. The ribbon is very similar to the WW1 Croix de Guerre so is often used as a substitute. The medal I brought has such a substituted ribbon. Previous PostMilitary Dress of the Peninsular WarNext PostBretonnian Knights – by Front Rank Miniatures. It might be my my great-great-great-great-grandfather’s medal!!!. Brian Smaller has posted the following article about the St Helena Medal on his blog. I’m mentioning it here because it relates to my great-great-great-great-grandfather.